Our Emergency Oxygen Inlets are housed in a rugged, fiberglass NEMA 4 weather-tight enclosure with padlock to prevent tampering or unauthorized access. The NPTF oxygen inlet supports high flow requirements, and it includes a ¾” 75 psig safety relief valve. 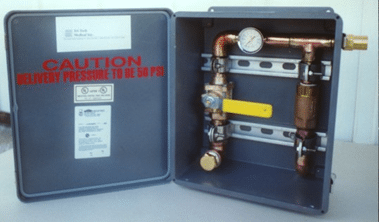 NFPA 99 compliant.